It is good to see that the film Suffragette has grabbed headlines since its release, putting the issue of women’s rights back on the public agenda by presenting a view of the most famous aspect of the fight for women to have votes in parliamentary elections. But decades before Mrs Pankhurst launched the WSPU, campaigners across the country had begun the struggle for this cause. So the film does need to be seen in a wider context, which includes the high level of male support for the cause in many places. It also was not just a London or city-based phenomenon. Plymouth was a location early demonstrating support for the cause, along with other places in the West Country, including Exeter and Bath. By the end of the 19th century, support was visible in North Devon (Barnstaple) as well as in Cornwall, with activists to be found in Falmouth, Newquay and Truro for instance. At first, the struggle for the vote was conducted politely, with the regular submission of increasingly large numbers of signatures on petitions to Parliament. But the objective was always unequivocal and clear: it was only democratic and just for women to be able to vote, so that they could help to elect representatives who would address the key social and moral problems of the day. It has to be admitted that the majority of those actively involved were middle class and educated, if only because they were the ones with more time and resources to devote to thinking about, as well as working for, the suffrage campaign. Many of them were also involved with other morally improving campaigns from temperance to slum clearance (and basically felt that men were not doing a good job, when left to themselves). But numbers of men as well as women in Plymouth and other places in the West Country also thought it unfair that women should not have the vote. Typically, many male supporters came from a Nonconformist background, because they were often more likely to be radical thinkers who supported changes to a number of traditional beliefs and ideas; which also meant that many identified themselves as members of the Liberal party. Nonconformity was strong in Plymouth, and it was also something of a Liberal stronghold, at least up to 1871 and returning to that loyalty in 1906. And apart from the 18 years between 1873 and 1892, Devonport was solidly Liberal in the post 1832 period. Unsurprisingly, it was Plymouth families associated with both Nonconformity and the Liberal interest, such as the Ramsays, the Latimers and the Braggs, who first took up the women’s suffrage cause in the 1860s. But the women of these and other local families had ‘form’ when it came to activism: they had been members of the Plymouth branch of the Ladies Anti-Slavery Auxiliary, which had long argued that one reason why slavery had survived so long was because women were excluded from Parliament. So, while the number of Plymouth signatories was not huge, it was predictable that as the national campaign gathered force, a Plymouth petition in favour of women’s suffrage was sent to London in 1869, to form part of the grand petition submitted to Parliament in June that year. Plymouth women activists were certainly interested in recruiting working class women, but usually as supporters rather than leaders in the local campaigns, though women who were either respectable tradeswomen in their own right (like successful milliners and dress-makers) or wives of leading tradesmen were actively encouraged. These women were all felt to have something in common in terms of the legal injustices facing women, which had to be tackled before it was likely the vote would be granted. But it was, in these early days of the struggle at least, never seen as just a woman’s fight. A large number of merchants in the Three Towns, including William Collier and Eldred Roberts Brown, along with local clergymen like Reverend Franklin Bellamy of St Mary’s, Devonport, were active supporters as well as their womenfolk. In 1873, the entirely male Plymouth Town Council voted to support the women’s suffrage bill being presented to Parliament that year. The initial problem facing women in arguing for the vote in the 19th century was that the vote was a form of property – after the Great Reform Act 1832, you ‘earned’ the vote by having property worth so much. The law in mid-Victorian days took the position that a woman was not competent to look after her own interests, and that therefore men took on the responsibility for them. So when women began to argue they should have the vote, married women were automatically excluded by law, because they could own no property in their own right as they were part of their husband’s legal personality. So until passage of the Married Women’s Property Acts in 1870 and 1882, reform of that legal presumption was the key focus for the fight, including in Plymouth. It all meant that Plymouth’s efforts in the cause did attract some of the big national names in the cause. In 1871, Millicent Fawcett addressed the first public women’s suffrage meeting (though, as the Chairman of the meeting, William Collier remarked, private meetings had been regularly held over the past three years). On 25 November 1873, Plymouth held a grand meeting, addressed by the indefatigable American suffragist Miss Beedy and the equally formidable Miss Caroline Biggs. Miss Beedy came back, to a meeting hosted by Reverend Bellamy in Devonport, the following year. Over the following decade, up to the passage of the Married Women’s Property Acts, regular meetings in either Plymouth or Devonport (more occasionally in Stonehouse) took place. 1882 was particularly busy – with speakers like Helen Blackburn visiting. Debates and meetings took place, including at the Borough Arms coffee tavern, underlining also the links with local temperance activism. In October, the Plymouth Debating Society invited women to attend its debate on whether or not women should have the vote – and the motion was carried. In 1884, a branch was established in Plymouth of the Women’s Liberal Association, which affiliated itself in 1889 to the Central National Association for Women’s Suffrage, the forerunner to the National Union of Women’s Suffrage Society. Once that battle was won, however, many women across the country became impatient at the continuing slow progress of the cause. Plymouth’s activism never died, but its public face dwindled until opinion was stirred up again by Mrs Pankhurst’s founding of the Women’s Political and Social Union in 1903. The Daily Mail labelled them ‘suffragettes’ as a derogatory term in 1905, and the WSPU had the wit to see what a useful label it was, and began to use it themselves, as part of distinguishing themselves from their non-militant sisters, along with the use of violet, instead of red, for their colours. The threat posed by the suffragettes lay in the fact that from the start, Mrs Pankhurst announced that violence would be a deliberately used tactic to win the fight for votes, justifying this by saying that history showed that the only way men had won the fight to extend the franchise was by using violence. The difference was that previous campaigners like the Chartists had always claimed that any violence was an accidental by-product of demonstrations and peaceful protests: what the suffragettes were planning was to take unequivocally violent action to advance their cause. This was a real challenge to the large numbers of Plymouth and Exeter women who supported votes for women: should they become ‘suffragettes’ or remain non-militant? More women locally as well as nationally preferred to continue the non-militant campaign, while still having some sympathy for their more militant sisters. The Ramsays, for instance, in Plymouth retained an allegiance to the non-militant cause and like the majority in the Three Towns, Mabel Ramsay wore the green, white and red, not green, white and violet. Finally, inspired by younger enthusiasts in particular, sometime in 1907 or early 1908 a branch of the WSPU was established in Plymouth, and it was not universally welcomed, especially by women in the towns and villages around the Three Towns. In fact, in 1908, a branch of the Women’s Anti-Suffrage League, opposing the idea of votes for women, opened up in the Three Towns, with Mrs Spender as President and Mrs Roland Yonge as Secretary – the Yonges were a branch of the county family settled at Newton Ferrars and related to the famous novelist (herself an anti-suffragist), Charlotte Yonge. The biggest suffrage-linked excitement, and biggest impact of the suffragettes on the Three Towns, came in 1913, by which time arson and other tactics had become a regular part of the suffragette arsenal. 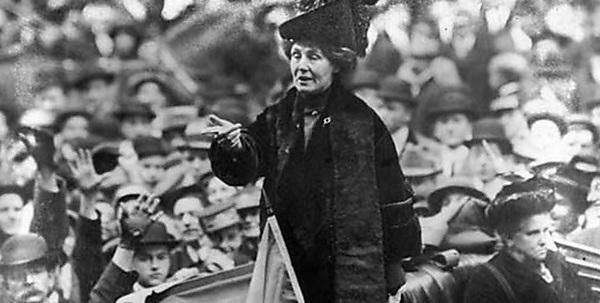 Mrs Pankhurst had been sentenced to three years penal servitude in April 1913, but – as a result of going on hunger strike – she was released several times during the summer under the terms of the ‘Cat and Mouse Act’. But in the autumn, she broke the terms of her licence by going to the US for a lecture tour and to raise funds for the WSPU. She planned to return for a big WSPU rally in London on 7 December – and when the Home Office learned of this, the Home Secretary issued a General Warrant for her arrest, to return her to prison, in order to prevent any appearance there. The Majestic was due to dock in Plymouth on 4 December, and aware of these plans to arrest their leader, suffragettes from all over the country descended on Plymouth. At least 5,000 were present by the morning of 4 December, when the White Star’s Majestic entered territorial waters, planning to intervene to prevent Mrs Pankhurst’s arrest by the local Plymouth police. This included 20 women, trained in ju-jitsu tactics, who also carried wooden clubs (then known as Indian clubs) under their skirts, who dubbed themselves as Mrs Pankhurst’s ‘bodyguard’, and under the leadership of Flora ‘General’ Drummond, they were unashamedly determined on physical tactics to protect her. The potential for trouble, and rioting on a scale that could have dwarfed the kinds of riots that were familiar to Stonehouse police in particular, was tremendous, and this almost certainly explains why the Chief Constable of Plymouth took the action he did. It was held by the awaiting suffragettes to be a shameful and cheating tactic, but what he did undoubtedly saved injury both to suffragettes and police locally. He went to Bull Point, which was not open to public access, and – accompanied by a prison wardress and by six policemen – he took a pilot boat launch out to the Majestic. Once on board he used his warrant to arrest Mrs Pankhurst, agreeing to let her be accompanied on-shore by American friend and travelling companion Mrs Rheta Childe Dorr (who had by this time sewed into her gown the cash – £4,500, around a quarter of a million pounds today – that Mrs Pankhurst had raised so that it could not be seized). On the return to Bull Point, Sowerby handed Mrs Pankhurst over to Scotland Yard detectives who decided to transport her via motor car past Dartmouth Prison to Exeter jail, and from there (eventually) to London. Mrs Childe Dorr was left behind and made her way to the Plymouth Dock, about the time that news came out to the awaiting crowds that Mrs Pankhurst had already been arrested and taken out of Plymouth. The awaiting crowd dispersed without causing trouble – but the suffragettes had not forgotten or forgiven. Later that month, a timberyard in Devonport, just off Richmond Walk, was set ablaze, causing £12,000 of damage (over a million in today’s money). Along with suffragette literature left at the scene there was a postcard stating it was revenge for the ‘cowardly’ arrest of Mrs Pankhurst, a clear reference to Sowerby’s successful tactics in evading trouble. It was followed up by tactics including pillar box fires, window smashing, heckling of opponents to the suffrage cause at local political meetings etc. Suffragette activity in the West Country only ceased with the outbreak of war in August 1914. In reflecting back on what the suffrage movement achieved, it is ironic that many suffragists and suffragettes did not benefit when votes for women became part of the Representation of the People Act 1918: the age qualification was set at 27 for a state. Also, in line with what the suffragette and suffragist leaders had been campaigning for, votes for women were granted on a property basis (including possession of a degree), rather than being part of the universal suffrage awarded to men. It was not until 1928 that the vote was equalised for men and women, and finally, the last vestige of a property qualification to vote in national elections disappeared. Dr Judith Rowbotham is a Visiting Research Fellow within the School of Law at Plymouth University. Suffragette is currently showing at the Plymouth Arts Centre, and on Wednesday 11 November, Dr Rowbotham and Professor Kim Stevenson will speak about its significance in relation to the South West.